Uplifting Love: It's My Choice! A week or so ago I wrote about a friend of mine who recently passed away. I called it "Lesson In Love". One of the comments that was shared with me by my friend Victory (check out her blog! ), pointed out one of the things I wrote that stood out to her. She said: "'it is my choice how much I love my wife'-what a powerful statement!" When I read that I thought to myself "I didn't write that. That sounds pretty profound." So I reread my post and sure enough I had written it. I guess it just slipped out. I suppose if you write enough you are bound to accidentally write something profound or insightful every once in a while. After contemplating this at length I decided it merited another post. This is that post. "It is MY choice how much I love my wife." How many times have we heard someone say (especially little children): "He/she made me do it!" For those of us that are parents, how many times have we responded "No one can make you do anything." If that's true, and it is, then we are in control of how we feel and how we respond to situations, statements, and other's actions. I love my wife because I choose to love her. If I choose to love her even more I can and will. She loves me because she chooses to love me. If she chooses to she can love me even more. It is MY choice. We've all heard people say things like "I just fell out of love with him" or "we grew apart and our love died." These things don't just happen. While it may not have been a conscious decision that the couple made to let their love die the day to day decisions they made, the small and simple ones, were conscious. Decisions like spending another hour or two at the office each day instead of with your spouse and family. Or choosing not to say "I love you" as frequently. We must mind the small and simple things in our marriages for them to grow and prosper. The more you tell your spouse that you love them the more that you will. It's your choice how much you love your spouse. 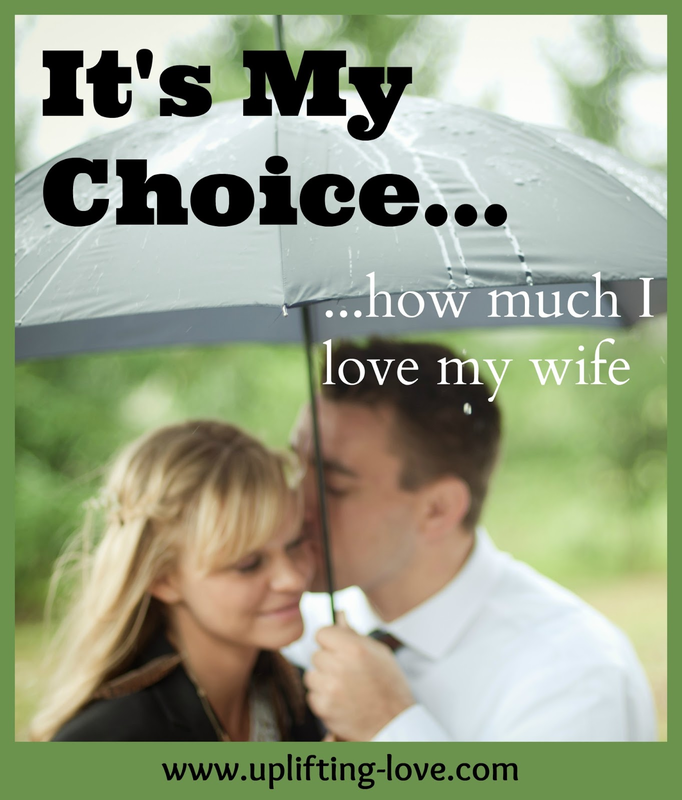 It's my choice how much I love my wife. And I choose to love her more! Make the choice today to love your spouse more. Now, go tell them that you love them. I've read a couple things so far today about choosing to love our spouses and invest in time with them. Maybe I really needed the reminder! Thank you for this. I think we often fall into the trap of thinking "love is a feeling." Nope. It's a choice. My husband and I sometimes tell each other, if we're not very happy with each other, "I still love you, I just don't like you very much right now!" We can still love each other even if we're not happy with each other. I choose to continue to love him even when he makes me mad, and he does the same for me. Some times we act more lovingly than others, but that doesn't change the fact that we've made a commitment to each other, to love each other always and no matter what. I definitely agree that it's our choice how we love our spouses. Like you said, it's those small, simple conscious decisions that accumulate. They can accumulate for good or bad but ultimately it's our decision. Love this post. Found you on Doing You Well Wednesday Link up. Amen, this is so encouraging and just what I needed today! Thank you for spreading JOY and sharing at the Oh What a HAPPY Day party. G'day and thanks for spreading a wownderful and positive message today! I definitely agree. The same way one can choose, anger we choose love. Choosing to love isn't always easy especially when the situation may naturally lead to anger but to choose love instead may actually help resolve the situation and diffuse it. I've definitely learned this in my own relationships (marriage and friendships). Thank you so much for sharing.